Recently, I visited Olney Farmer’s Market where I picked up a bundle of foodie delights to experiment with over the coming weeks. As I was in serious need of a good pot of jam, I paid a visit to the ‘Humbers Homemade Preserves’ stall to sample a few of the delicacies they had on offer. Based in Flitwick, Bedfordshire, Humbers Homemade Preserves are a small company set up by Vickie when life changing circumstances in 2007 saw her making tons and tons of jam in her kitchen at home without a jam lover on hand to eat it! I don’t think that would happen in my home but I am certainly glad it did in Vickie’s as from then on, the business grew and now Humbers visits over 15 different farmer’s markets a month and supplies local delis, farm shops and hotels. As you can see from the label, Humbers have won several awards including the ‘Taste’ seal of approval. They sell a wide range of jellies, jams, curds and chutneys and had several available to taste at the farmer’s market. For full details of where you can purchase products from the Humbers range, check out their website here. 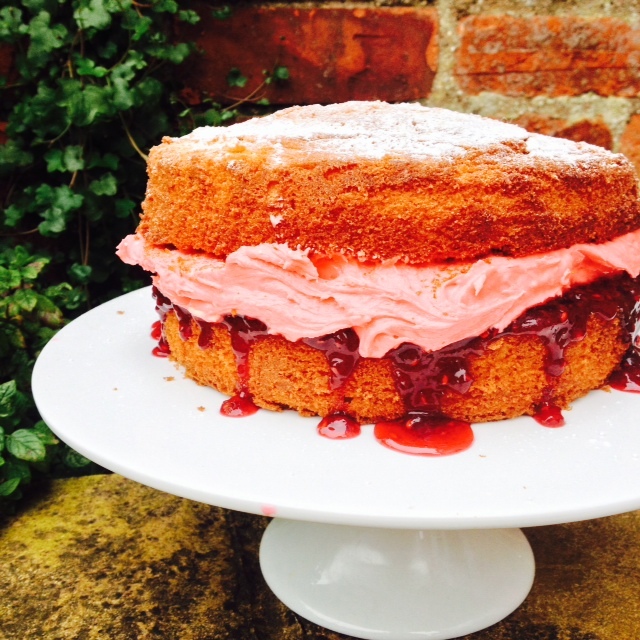 What is more perfect than a classic Victoria sponge with tons of buttercream and lashings of homemade raspberry jam? I can’t think of much, so last weekend I decided to whip together a quick cake for grazing over after mother’s day lunch. Unfortunately, as I had a friend visiting and I’m still adjusting to my new oven, it was a bit of a haphazard attempt! The below recipe is from the Great British Bake Off ‘How to Bake’ cookbook and still hasn’t failed me yet, despite my distracted attempts last weekend…. 1. Pre-heat the oven to 180 degrees. Grease two 20.5cm sandwich tins and line with baking paper. 2. Beat the butter in a bowl or electric mixer until softened. Gradually add the sugar and beat for several minutes until the mixture is light and fluffy. 3. Break the eggs into a measuring jug and beat lightly with the vanilla essence. 4. Slowly add the eggs to the butter and sugar mixture a tablespoon at a time, beating well after each addition and scraping the sides to ensure all ingredients are well incorporated. If the mixture looks like it is starting to curdle, add a tablespoon of flour. 5. Sift the flour and add to the batter, folding it in with a metal spoon, ensuring that you do not over-mix and knock the air out. 6. Make sure that all ingredients are combined before pouring the batter into two separate tins, distributing as evenly as possible. 7. Bake for 20 – 25 minutes until the sponges are golden and springy to the touch. Remove from the oven and leave for a minute in the tins before removing, using a knife if necessary, and turning on a wire rack to cool completely. 8. Meanwhile, make the icing. 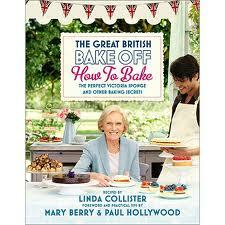 In an electric mixer or using a large bowl and wooden spoon, beat the butter until soft. 9. Beat in the icing sugar before adding the milk, vanilla essence and food colouring (if using). Mix until all ingredients are combined. 10. Once the cakes are cool to the touch, spoon the jam liberally onto the sponge you will be using for your base. Then top with a ridiculous amount of buttercream (if you are only using it in the middle of the cake) and top with the remaining sponge layer allowing icing to ooze out of the middle and drip down the sides of the cake for a rustic effect. Sprinkle caster or icing sugar on top and viola, time to dig in!!! Of course, this recipe provides enough buttercream to ice the entire cake, including the top and sides, but we wanted a massive amount of tasty filling; as the pictures show we certainly got the desired effect! 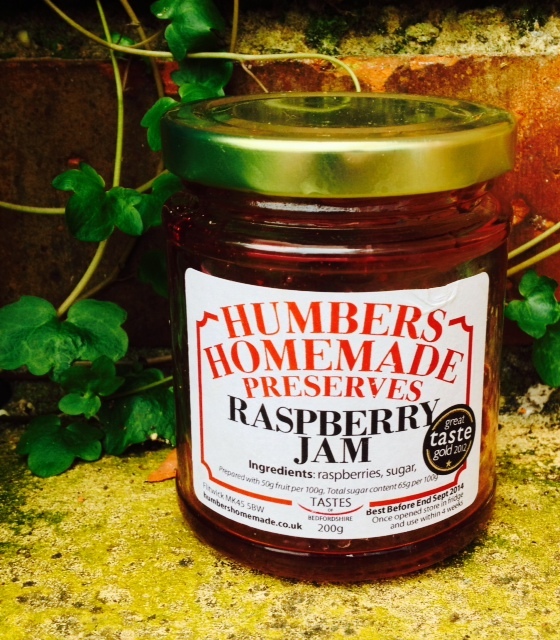 We also used a, some may say, excessive amount of jam but when it is as good as Humbers’, it seems rather silly not to! The jam complemented the sponge cake perfectly and along with the pink buttercream, the cake was transformed from a typical Victoria sponge to something a little more interesting, whilst supporting local businesses along the way! Don’t forget, Olney Farmer’s Market is this coming Sunday so be sure to pay it a visit and you can pick up some Humbers Homemade Preserves of your very own! 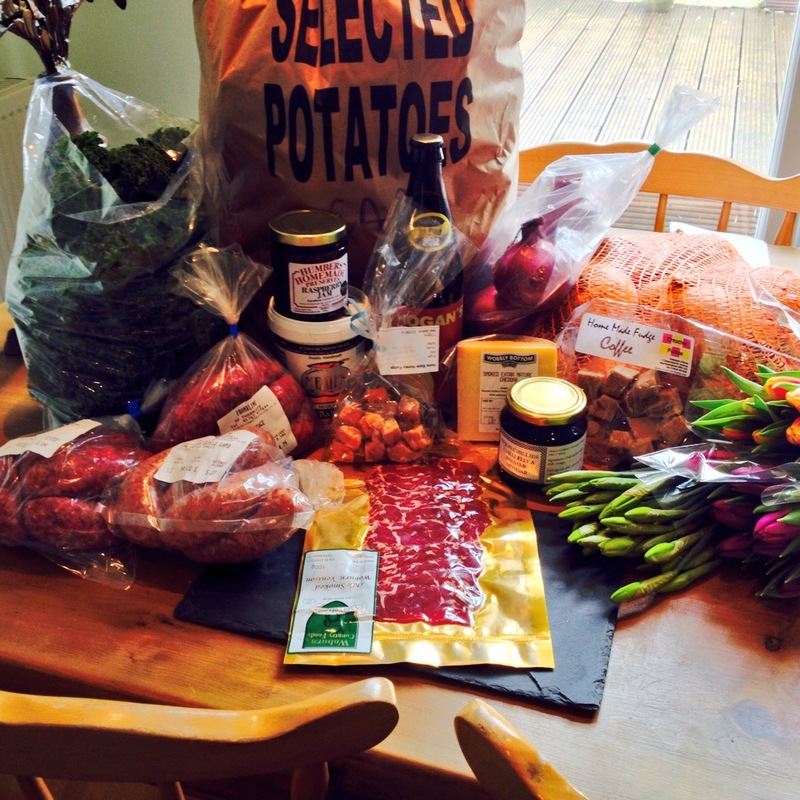 A week and a half ago, I was lucky enough to have the time to go to Olney Farmer’s Market. 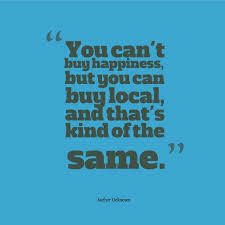 I really do adore farmer’s markets, they are a foodie’s dream providing a wide range of locally produced foodie delights; not only are they are they a great way to discover new local products, they are also a lovely way to spend a morning, browsing and talking to fellow foodie enthusiasts. Olney is well worth a visit, even if the farmer’s market isn’t on. 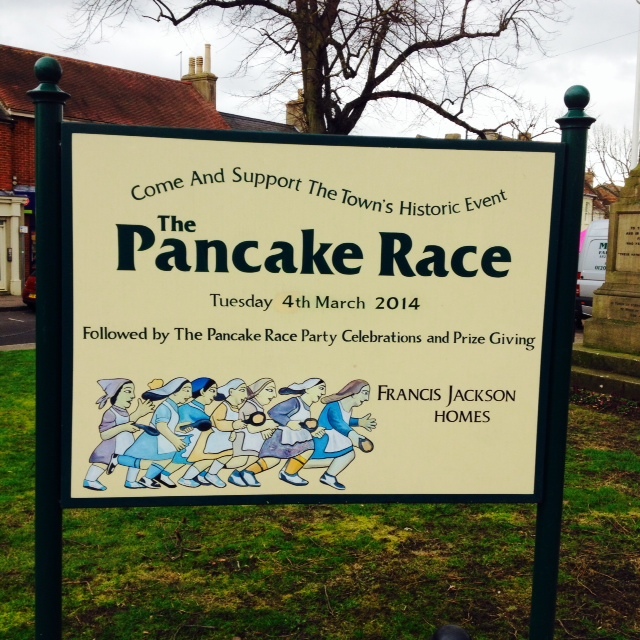 The small town has a food related history; the wold famous ‘Pancake Day Race’ has been run by many competitors here every Shrove Tuesday since 1445. Rumour has it that the tradition started when a housewife, upon hearing the bell for church, ran out of her house with her frying pan in hand as she had been preparing pancakes to mark the beginning of Lent. Each year, the women and children of the town run a 380m distance along the main road dressed in aprons and headscarves whilst flipping pancakes with onlookers from around the country! The town is pleasant to walk around with many independent gift and antique shops surrounding the market square. There are also some wonderful food related shops including the Olney delicatessen on the main road, Bacchus Independent Wine Store which offers a large selection of local ales and Much Ado, a local deli and tea shop. 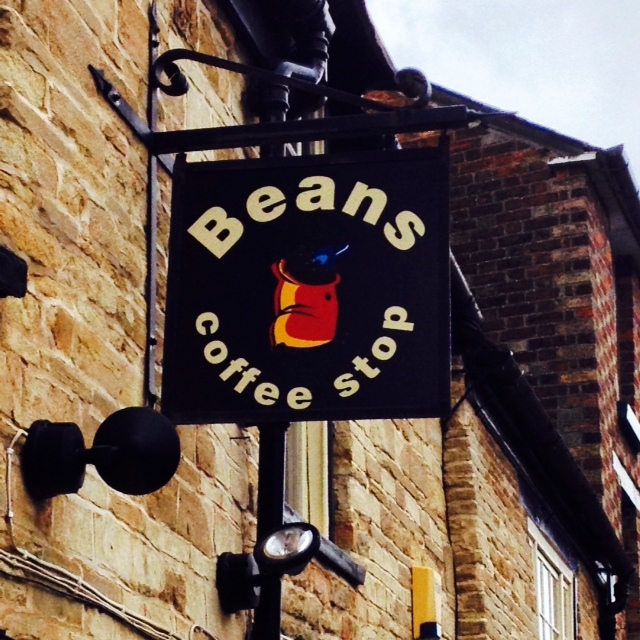 The town also boasts several independent restaurants and cafe’s such as family runs Bean’s Coffee Stop which is on the market square along with the Bull Inn which has recently come under new ownership. I must admit, Neil and I really couldn’t help ourselves and went a bit mad purchasing yummy treats from many different stalls! As so many different producers have stalls at the market, I thought I would write a post about our purchases from each one over the next few weeks. Watch this space for posts about our purchases and some of the companies featured above. I decided that tonight we would have a chilled out dinner which involved very little preparation and cooking. I have wanted to go on a picnic for so long however, the British weather has prevented Mr MAC and I from using the gorgeous picnic hamper he bought me for my birthday last year. The obvious solution to both issues? 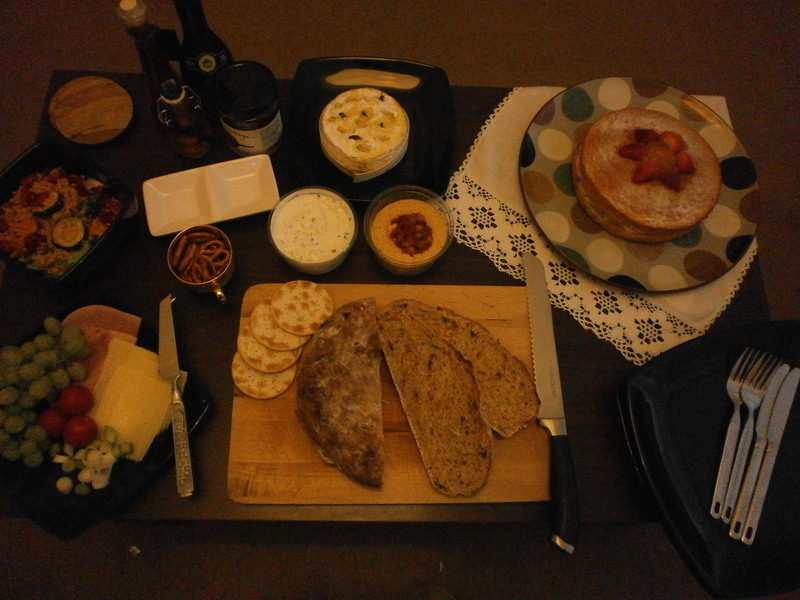 An impromptu picnic in the living room! 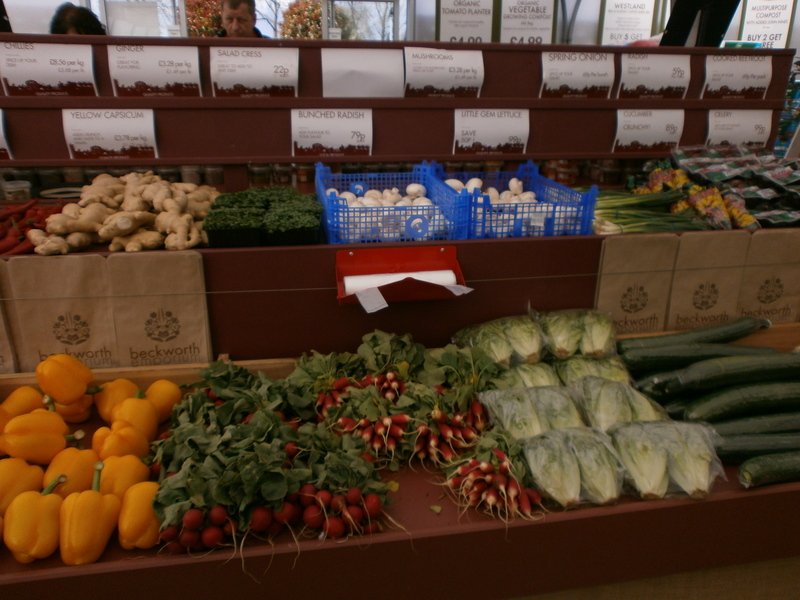 This is my favourite type of meal – lots of yummy dishes I can pick and chose at; a lot of which have come from local producers and suppliers. I am stuffed now though!! Sometimes, it is vital to just sit back, relax and appreciate all of the gorgeous, tasty food that is so easily accessible to you. We are really very fortunate. Yesterday, I decided to go to a few of my favourite local shops for a bit of a browse and some inspiration. 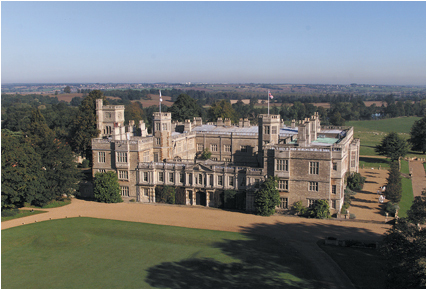 The sun was out and it seemed like a great opportunity for a drive through the Northamptonshire countryside and purchase a few foodie treats for the weekend. First stop was ‘The Lader’ in Castle Ashby. This is a great little delicatessen which is part of the rural shopping yard in the grounds of beautiful Castle Ashby. The shops stocks a large selection of goods from daily freshly baked bread and pies to a large selection of cheeses, chilled desserts and upmarket cupboard staples. I tasted a few oils and balsamic vinegars and decided to purchase a bottle of the strawberry balsamic. The flavour was quite sweet but will work well with savoury dishes too. I hope to use it soon poured over vanilla ice cream with mint and blueberries or in a spinach, black pepper and strawberry salad….bring on the summer!! 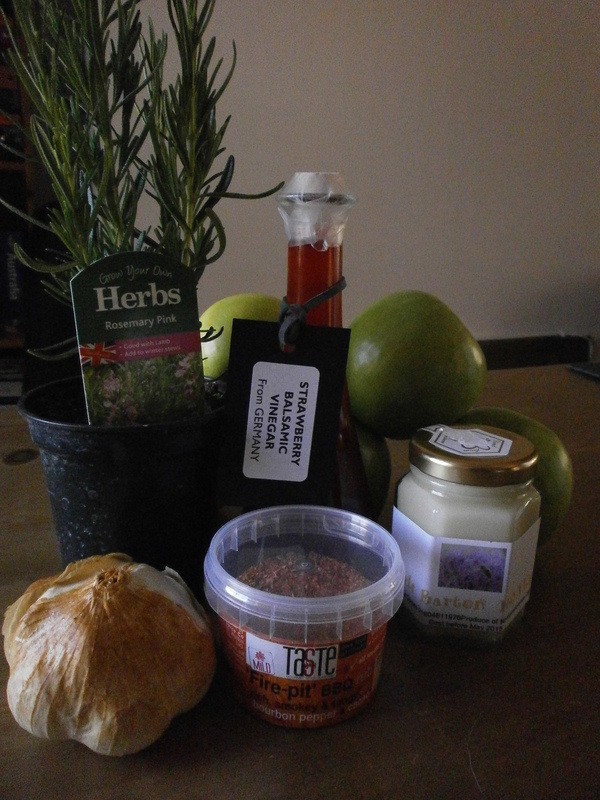 I also purchased a bulb of smoked garlic; something I have been meaning to buy and experiment with for quite some time. 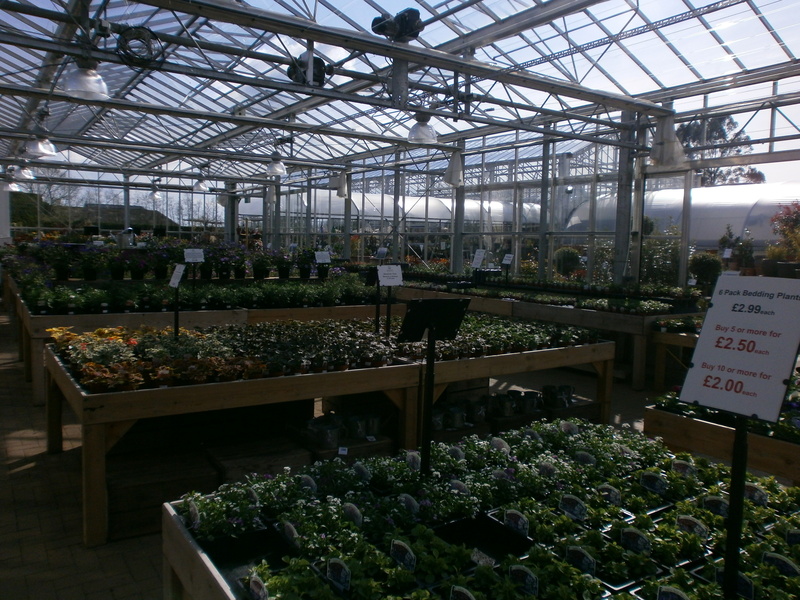 My hands smelt wonderfully smokey for the rest of my time browsing around the shopping yard – the scent was so strong! Tonight, I cooked roast beef and decided to roast some potatoes with rosemary and the smoked garlic for an extra bit of flavour….they were absolutely delicious! 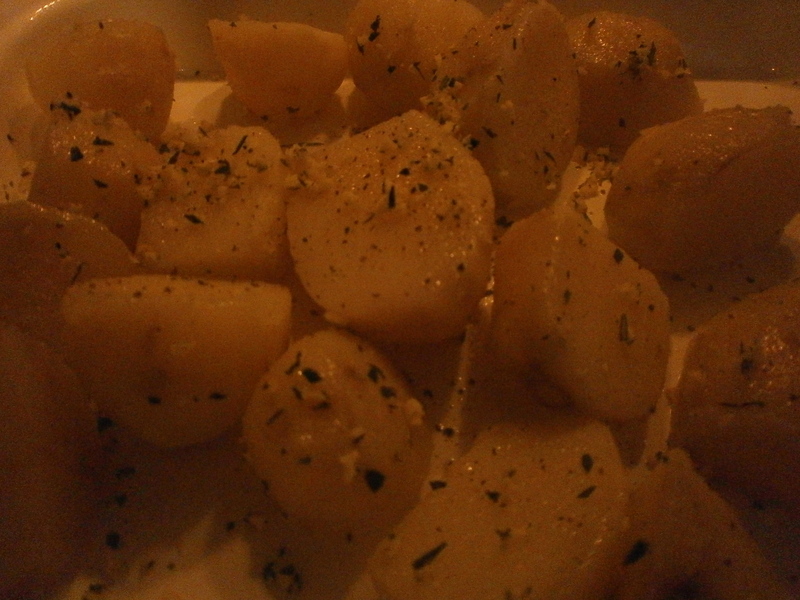 Of course, I made the potatoes suitable for Slimming World by using spray oil but by incorporating the garlic and herbs proved that low-fat healthy food can be far from boring and really tasty! After a short pit stop visiting my parents, it was time to pop into the craft and farm shop at Earls Barton on the Mears Ashby road. This shop holds craft days on the third Saturday of every month and is half craft shop, half farm shop. Craft shops aren’t really for me but they had a small but lovely selection of vegetables, herbs, both fresh and frozen meat (including partridge and pheasant) and locally made jams and chutneys which were proudly advertised as having won first, second and third prizes in the Earls Barton fair. Here we brought a few veggies, that all important rosemary (for the roast potatoes!) and locally produced honey. And a cafe….but that photo and post will have to wait for another day! 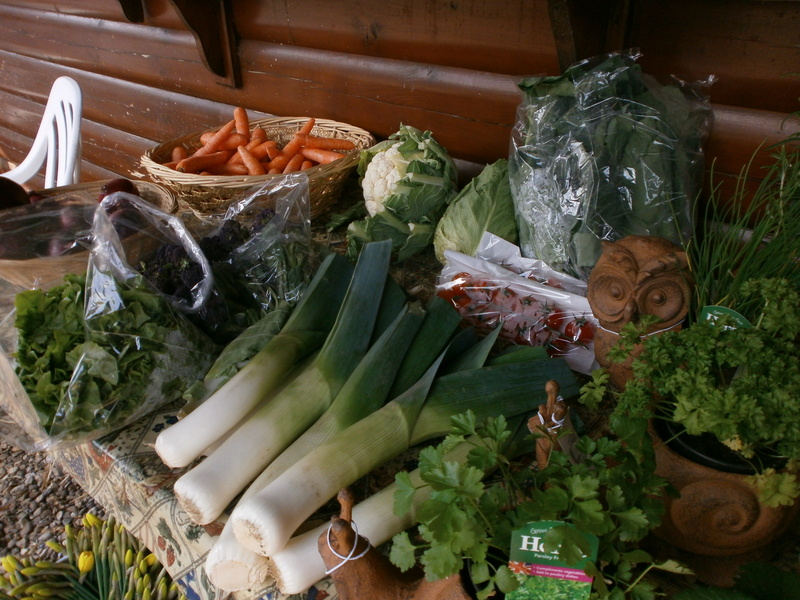 We had a great time browsing around and bought some lovely local produce. We also got talking to Mark from the Gourmet Spice Company. 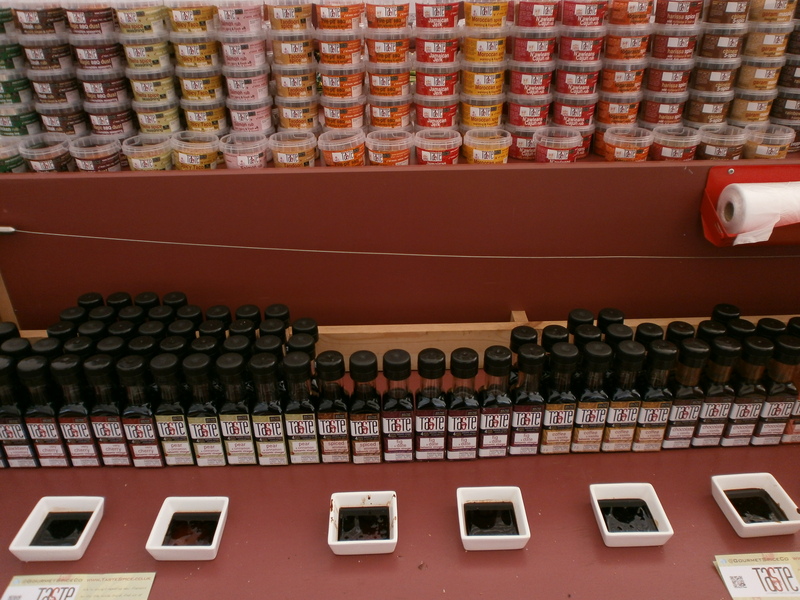 The Gourmet Spice Company are based in Northamptonshire and make spice blends, oils, balsamic vingears, salts and sugars; we were fortunate enough that they were doing a taster day in Beckworth’s on Saturday. They use only the freshest ingredients and many of the spice blends had been produced only a few days before. 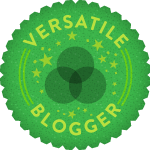 I had a taste of a few of their vinegars and can testify that their ‘Chocolate and Vanilla Balsamic’ was delicious! So chocolatey! In fact, I am quite annoyed with myself for not buying any. Luckily, I did buy a pot of the ‘Fire Pit BBQ’ rub which is flavoured with bourbon and cacao. I am really looking forward to cooking with it! Some wonderful treats from some fantastic local businesses….make sure to stop by at all three next time you are in Northamptonshire! 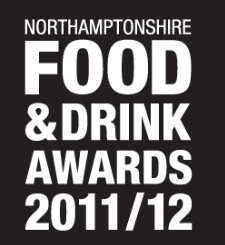 Annual Northamptonshire Food and Drink Awards launched – Food & Drink – Northampton Chronicle and Echo. I came across this article on the Chronicle and Echo’s website yesterday. I am a big fan of Northamptonshire’s Food and Drink Awards and have previously visited many of the nominated premises – I can honestly say the standard each year has been very high! I am thoroughly looking forward to finding out the nominees for this year’s awards and intend to pay visits to as many as possible! Watch this space…. On Monday night, I decided to cook up a casserole using Brown’s Gourmet Sausages. It was time to use the pork and chorizo sausages that had been stored in the freezer since our last trip to the market; both myself and Mr MAC are big fans of chorizo so were thoroughly looking forward to trying these sausages! Chorizo and tomato compliment each other perfectly so I decided to cook up a sausage and vegetable casserole. In a grill pan, brown the sausages. Once brown on all sides, put in a casserole dish and set aside. Spray frylight into a frying pan and heat. Once hot, add onion and garlic. Cook for a few minutes until softened. Next, add the pepper. Cook for a few minutes before adding the smoked paprika to taste (I would suggest about a tbsp but this may be too spicy for some!). Add glug of red wine and allow to cook out for a few minutes. Add the chopped tomatoes and basil and stir. Spoon over the sausages in the casserole dish. Transfer the dish to a preheated oven (200 degrees) for approximately half an hour. I served mine with mash and mange tout but next time, to improve the flavours in the dish, I would serve with sweet potato mash as it goes so well with chorizo. Jamie Oliver has a fantastic sweet potato mash recipe using mango chutney and coriander which can be found here and I think would go really well with this dish. 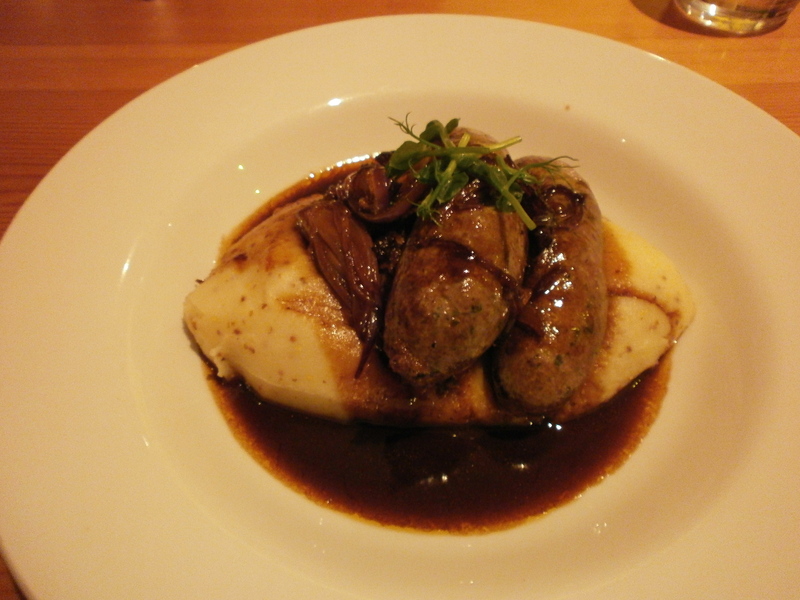 The sausages were really tender and full of flavour. The chorizo flavour was not to overpowering and the smoky tomato sauce complimented it beautifully! As it was Saturday night last night, Mr MAC and I decided to have something a little more calorific and hassle free for dinner; burgers! We defrosted some lean steak mince and divided into two so we could each create our perfect burger. Mix together the mince, red onion, basil, garlic, cheddar, balsamic and seasoning. Form the mixture into two small burger patties squeezing out any excess moisture. Spray a griddle pan with frylight and heat. When hot, add your burger patties. Cook for approximately 7 minutes each side. 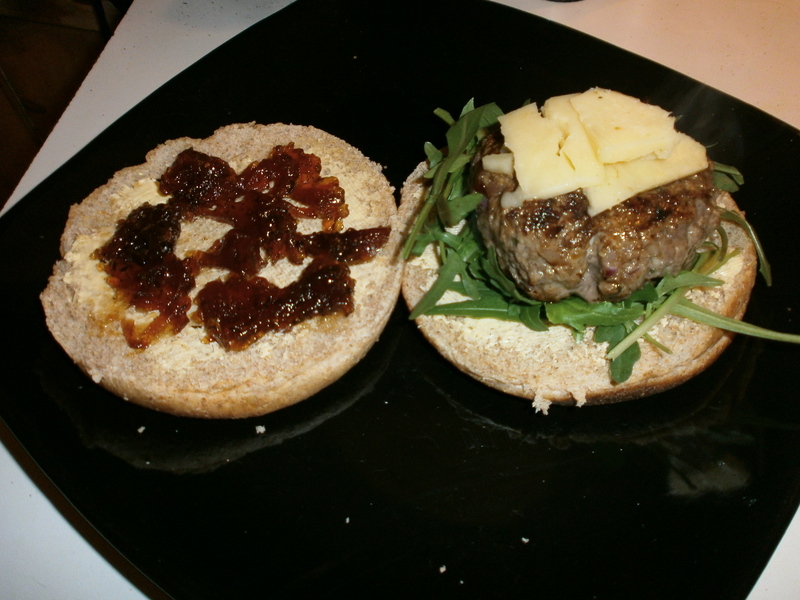 Slice your bun in half putting rocket on one side and red onion chutney on the other. When your burgers are almost cooked, place a few slices of cheddar on top of each. Cook for a few minutes until the cheese has melted. Add both burger patties to the bun. Enjoy! I am completely in love with the chutney I used. I have been buying the same red onion chutney for the last few years and nothing else really compares! It is made by The Pickled Village in Bulwick, Northants ; the company also creates marmalades, pickles and relishes. This particular chutney is called ‘The Red Raspillion’ and is a red onion chutney with chillies and red currants. 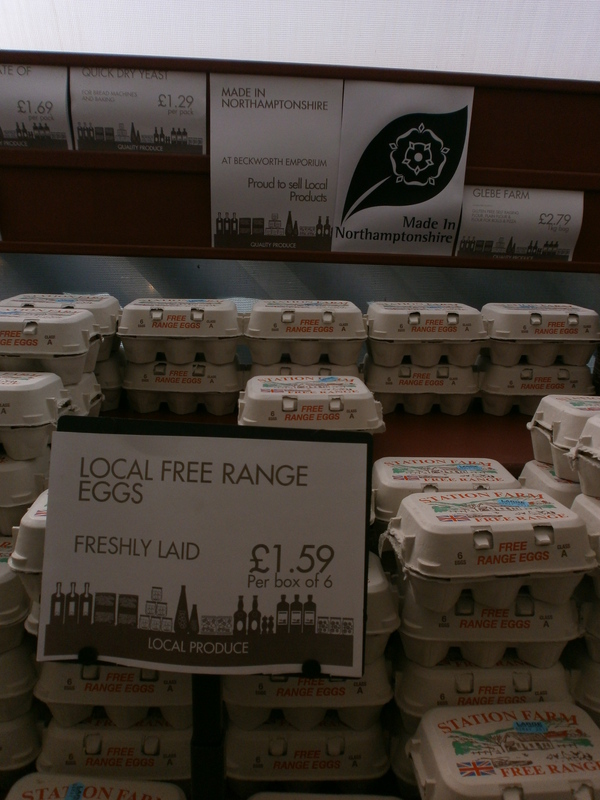 It is sold in retail outfits across Northamptonshire including Beckworth Emporium as well as mail order, I’d really recommend trying some! Mix together the mince, spices, seasoning and cheese. Form the mixture into one large burger squeezing out any excess moisture. Spray a griddle pan with frylight and heat. When hot, add your burger patties. Cook for approximately 10-12 minutes each side on a medium heat to keep in the juices. Slice your bun in half spreading the mayo on each side. Put the lettuce on one side and ketchup on the other. 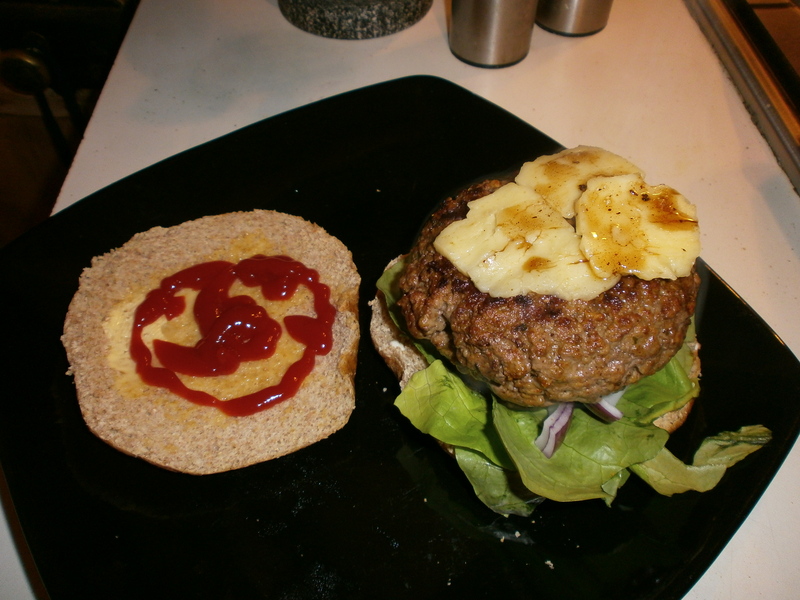 When your burger is almost cooked, place a few slices of cheddar on top. Cook for a few minutes until the cheese has melted. Add the burger to the bun. Enjoy! Mr MAC and I were expecting his family for lunch today and after a walk to Abington Park, we decided to buy a few treats from Icing on the Cake. I love just walking into this shop, all you can smell is sugar and cake; its fantastic! The bakery isn’t a shop per say but it does sell a few cupcakes, muffins and a few slices of cake. 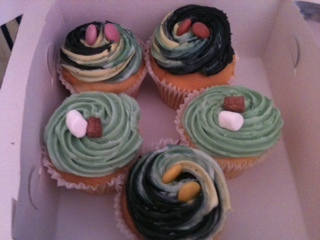 Today, it was very busy but I managed to nab us a few cupcakes. They were as delicious as they look; the sponge was really light and fluffy and the buttercream icing was just perfect. Icing on the cake specialises in cakes to order for weddings, birthdays and special occasions and their designs look simply amazing. Check out their website for more details! They also sell cake boxes and rent cake tins and displays. Last night, Mr MAC treated me to a surprise meal out. He told me he had booked a table for 8pm but I had no idea where, so we jumped in the car with sat nav in hand. The only clue I was given was that the place we were going to was a finalist in the Northamptonshire Food and Drinks Awards. The Northamptonshire Food and Drink Awards is all about “…celebrating all that is great about local produce and drink, rewarding excellence within the county’s dining venues and rewarding those who work so hard within the culinary sector”. I had a fair idea that our meal would be something pretty special but no clue as to where we were going! When we arrived at ‘The Walnut Tree Inn’, I was very pleased. The Inn is very close to where we live and looked inviting from the outside. The only issue was, there was very little parking especially as there was a function on that night. We were a little bit early for our table so, the waitress suggested we have a drink in the bar to start with. The bar is really lovely and cosy but still retains a sense of style with polished wooden floors, comfy leather sofas, an open fireplace and chunky wooden tables. The pub features lots of live events; acoustic nights every month, regular comedy nights, a quiz night and live music every Saturday. The waitress at our table later described the Walnut Tree as “more of a music pub” and I hear that the music nights at The Walnut Tree Inn are very popular. I will look forward to going to one in the future! Food is served in the bar area also and there is a good selection of beverages on offer. They believe in supplying local ales and supporting local producers and this is evident in everything they do from the food, to the drink – something I am a big fan of! When our table was ready, we were shown through to the dining room just off the main reception. The restaurant is spacious and features chunky wooden furniture, polished wooden floors and is lit by candle light. There is plenty of room for larger groups and in fact, towards the end of our meal a table of 10 was seated. I will say that the restaurant is a little dated in places but all in all, it is a nice place to eat. On to the food! We both found the menu really appealing. Again, I really liked that The Walnut Tree is passionate about using the best local ingredients and supporting local business. On the menu was a fillet steak from the Nobottle estate and Northamptonshire Chicken reared in Yardley Hastings. The menu also acknowledges and thanks all of The Walnut Tree’s suppliers – a nice touch and handy if you want to purchase some of the same ingredients yourself!! We were offered drinks straight away and shortly afterwards, we were brought an ice-cold bottle of tap water to help ourselves to, a touch I really like. The tables were laid in advance and we had both wine and water glasses along with a good quality serviette. I know it may be old-fashioned but these are the little touches I like and make me feel like I’m having a treat by going out to dinner. 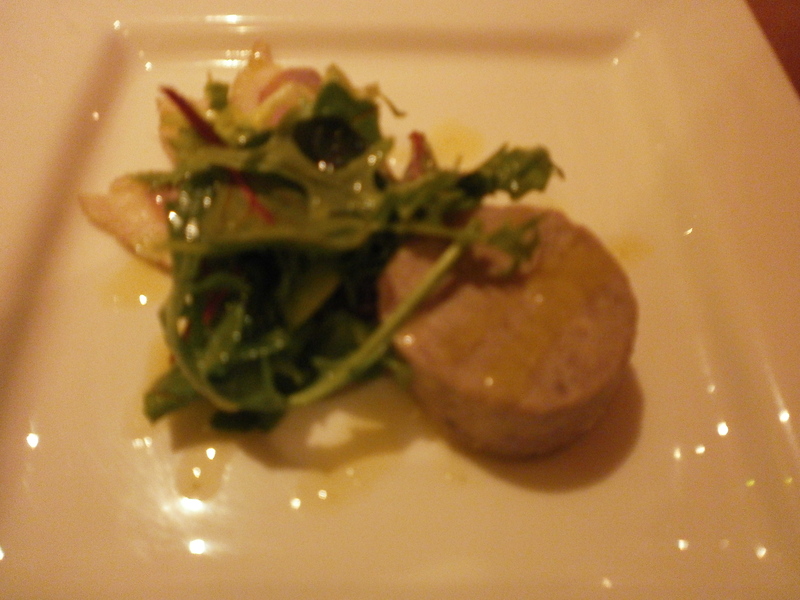 As my other half and I were so enamoured with the menu, we decided to order a starter and a main. I chose the ‘Duck confit rillet with a home smoked Northampton duck breast and citrus dressing’ whilst Mr MAC chose ‘Chargrilled Halloumi with roast red pepper, olives and harrissa dressing’. My duck was fantastic, the dressing was really zingy whilst the duck was perfectly cooked and had a lovely smoky flavour. Mr MAC said his halloumi was excellent also and that you could clearly taste each element of the dish. Both dishes were beautifully presented. For the main course, we were both tempted by so many of the options but in the end, I settled on ‘Duo of Northants Chicken – roast breast meat, with apricot, lemon and thyme stuffed thigh, pomme puree finished with a pan jus‘ while my companion chose ‘Venison Sausages – with wholegrain mustard mash and a caramelised red onion gravy‘. Both dishes were again beautifully presented and tasted absolutely delicious. 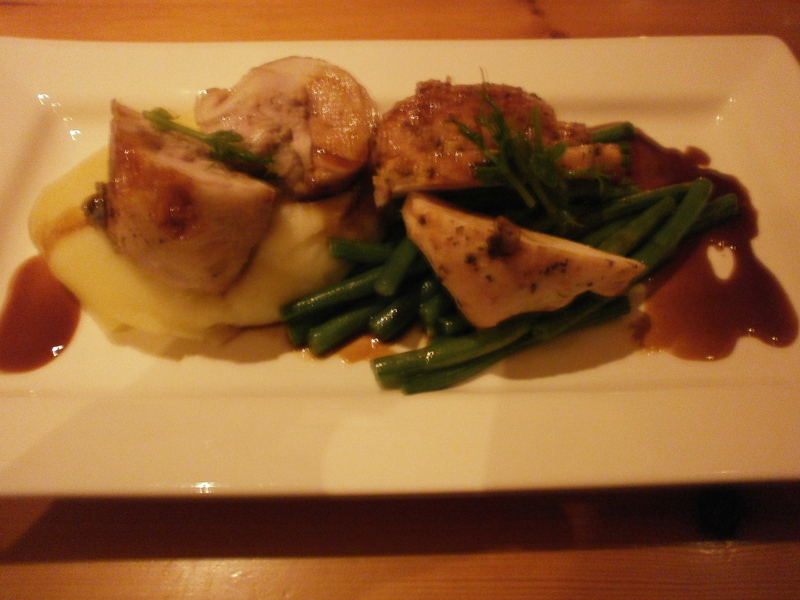 My chicken was so tender and tasty, the potatoes creamy and smooth and the sauce delicious! The sausages were a little bit crumbly but tasted divine but the star of his dish was most definitely the gravy; a little bit sweet and packed full of onion flavour. We both love caramelised onion gravy but mine certainly did not measure up to The Walnut Tree’s – I will have to get experimenting! The portion sizes were just right and although I was just the right side of ‘full’, I couldn’t resist a dessert! I resisted the ‘Chocolate Fondant – with Tia Maria milkshake and clotted cream‘ which probably would have been my normal choice. 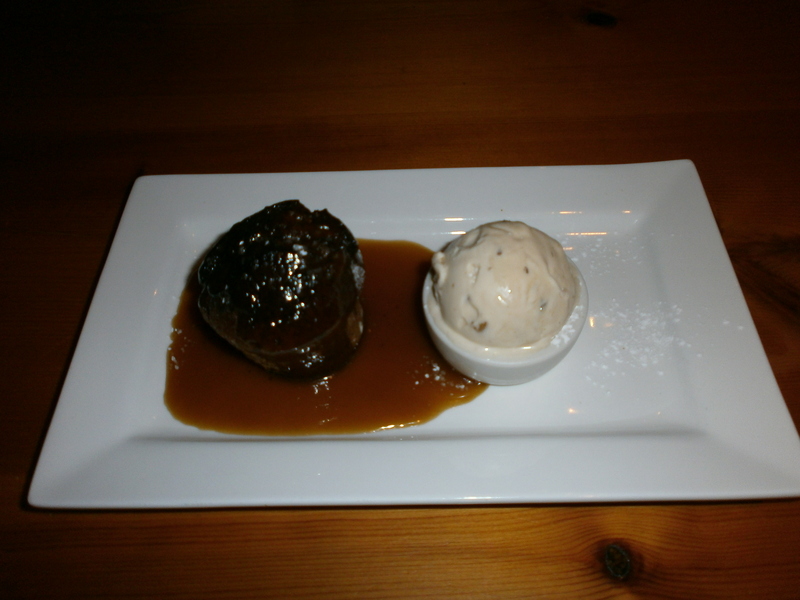 Instead I chose ‘Walnut Tree Sticky Toffee Pudding – with maple and walnut ice cream’. I visited Cartmel, home of the sticky toffee pudding, last October and I would definitely say that The Walnut Tree’s version is just as good if not better! The toffee sauce was divine and the ice cream was packed with flavour. definitely a good choice! 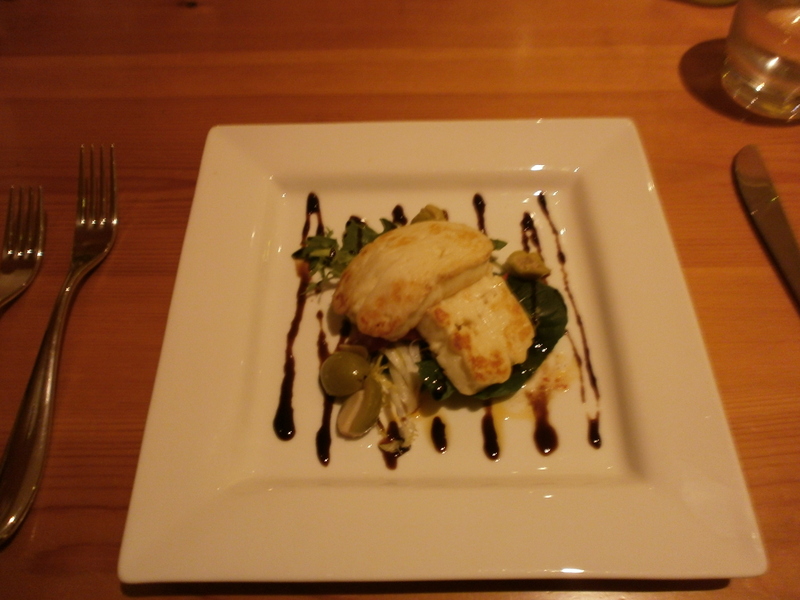 We thoroughly enjoyed our meal at The Walnut Tree and would highly recommend a visit. The service didn’t let the food down and our waitress, Sarah, chatted about the events on at the Inn whilst we paid the bill and gave us a bit more information about the restaurant and food. Both the front of house staff and chefs really seem to have a pride in the food they serve and the events The Walnut Tree offers which makes a very refreshing change and a great atmosphere for a meal out. A better name for this post would probably be ‘The Best Sausages EVER’ because, they really really are the best sausages I’ve ever tasted! Brown’s Gourmet Sausages are made on a farm near Wollaston in Northamptonshire and are sold at a few select markets and restaurants across the county. Luckily for us, Brown’s have a stall at Northampton market every Saturday so last weekend, Mr MAC and I decided to pay them a visit. Sage and Onion – Fresh British onion and sage. A classic combination. Spanish and Chorizo –A marriage of garlic, red peppers and red wine. Butternut Kiss – Butternut squash, creamed coconut, coriander and a little chilli. The man on the stall was very patient with us and even gave us free tasters of the Anglo Indian sausage (An intense Indian sausage, garam masala, bay leaves, ginger and red chillies) which was truly scrumptious! We were also very lucky to receive a free Ploughman’s sausage and an Italian sausage – great customer service!!! Some of the sausages we have put in the freezer to eat at a later date but, last night, we could wait any longer and decided to have a lazy Sunday night meal consisting of a sausage and caramelised onion sandwich. 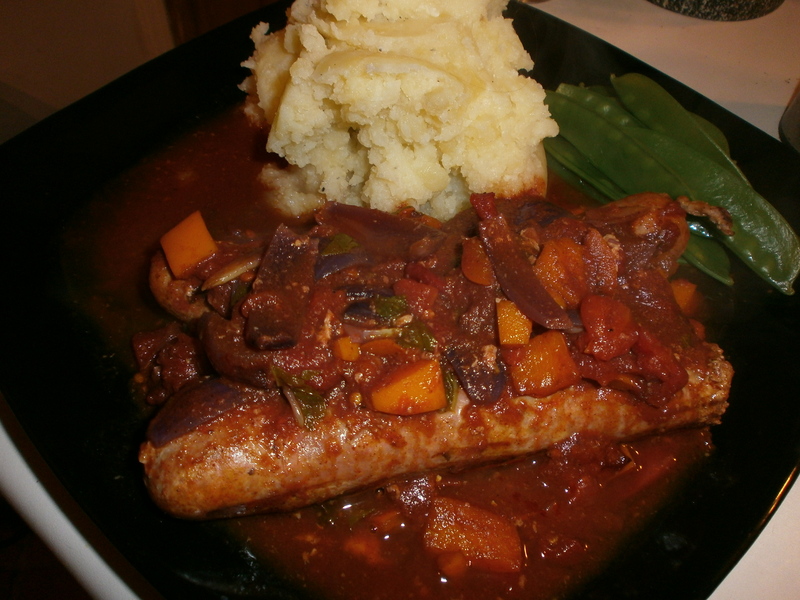 These sausages really made a regular, throw together, lazy meal something a bit special. I had the two ‘free’ sausages which were bursting with flavour, absolutely phenomenal. My better half thoroughly enjoyed his sage and onion sausages too. I love the way you can taste every ingredient in these sausages, something that Tesco really can compete with! 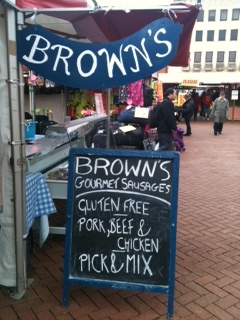 We will definitely be returning to Brown’s market stall without a doubt. For those of you that live in the UK and are interested in finding out more, check out the website here. You can even order on-line…..!